Sharp price movements are common at year-ends in many markets, reflecting the relatively low liquidity that results, in part, from infrequent point-in-time regulatory reporting. Events in late 2018 highlighted two developments. First, market participants and central banks made adjustments to cope with recurring price anomalies: the former front-loaded the adjustment; the latter sought to ease it. Second, year-end illiquidity makes funding and collateral markets vulnerable to unexpected events. The developments also illustrated the channels through which such price dislocations can propagate across financial markets. FX swap markets were relatively steady in late December, although volatility had risen earlier in the year. In the past, these markets had seen sharp spikes in the cost of the US dollar against the euro and yen at year-end (Graph A, first panel). These occurred at different points over the past years, as traders manoeuvred to take positions ahead of crowded dates. This time, the three-month FX swap-implied basis dropped sharply at the end of September. This reflected a combination of investor demand from prefunding of US dollar positions and high price quotes by dealers in order to manage year-end inventory balances. Even though the drop was not as pronounced as in the past, the basis remained wider for longer, pointing to the less stark but longer-lasting effects of year-end pressures. European repo markets, too, were more resilient at the end of 2018 than in previous years. 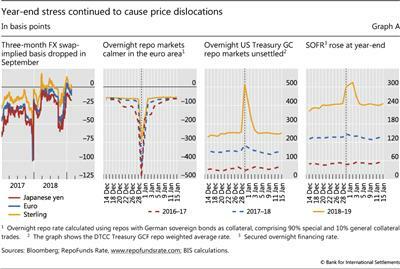 For example, repo rates for highly sought-after German collateral did not drop as much into negative territory as in prior episodes (Graph A, second panel). Anticipating year-end stress in markets, investors moved ahead to lock in funding and manage collateral. 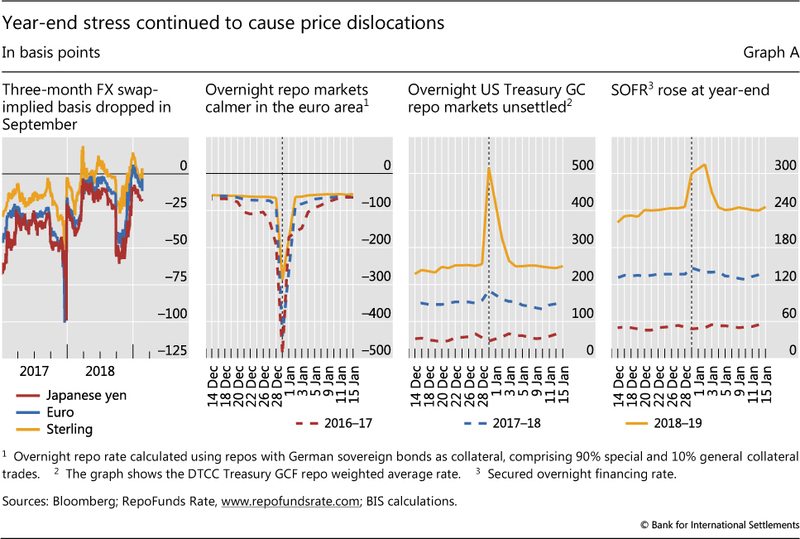 Moreover, broader and easier access to securities lending programmes by the ECB and national central banks no doubt helped mitigate year-end dislocations. Despite front-loaded adjustments, financial markets remained vulnerable to the impact of unexpected events. Large-scale US Treasury issuance took place on the last day of December, a point in time when dealers are reluctant to expand their balance sheets due to regulatory reporting. As a result, the Treasury general collateral (GC) repo rate jumped by 260 basis points (Graph A, third panel). Localised year-end stress can spill over to other markets if it affects rates used to calculate benchmarks. A case in point was the spike in the secured overnight financing rate, which is an alternative benchmark rate to LIBOR based partly on Treasury GC repo rates (Graph A, fourth panel). More generally, these developments reflect the fact that, post-crisis, financial institutions have recognised that the balance sheet has a price. This improvement in risk management has been hard-wired by regulation. See BIS Annual Economic Report 2018, Chapter III, for further discussion. See C Borio, R McCauley, R McGuire and V Sushko, "Covered interest parity lost: understanding the cross-currency basis", BIS Quarterly Review, September 2016, pp 45-64, for further discussion of factors affecting the cross-currency basis. See also A Schrimpf and V Sushko, "Beyond LIBOR: a primer on the new benchmark rates", BIS Quarterly Review, March 2019.